A 22km bike ride with an English speaking local guide to explore the Battambang countryside and learn about traditional livelihoods in the area, see how products are produces and learn first had about daily life. A 33km bike ride with an English speaking, First-Aid trained, local guide to explore the Battambang countryside and learn about traditional livelihoods in the area, see how products are produces and learn first had about daily life. 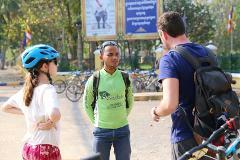 Your guide will take you by bicycle to witness first hand the melting pot of cultures, ethnicities and religions, that exist in modern Cambodia with visits to a temple, local Muslim village and more! 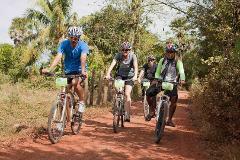 Ride through the countryside to learn about the juxtaposition of tradition and modernity in Cambodian village life.